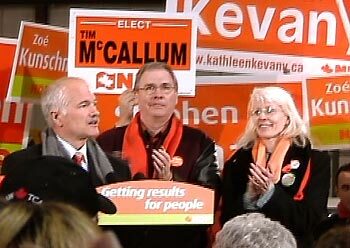 Editor's Note - While video and audio feeds have been provided in a fair and non-partisan manner, The Maple City Star concentrated online coverage on the campaign of Kathleen Kevany based on the ease with which access to the national leader was granted, and the NDP was the only party to provide Press Releases to us, which were attributed as such and published verbatim. 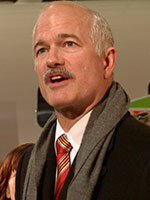 The 2006 federal election campaign has veered Chatham-Kent-Essex to the right, as Dave Van Kesteren drew the most support in yesterday's polls. Over 65% of eligible voters made the treck to the polls. Initially, a winter campaign raised the spectre of an election day blizzard. Instead, mother nature provided one of the mildest winter periods on record. The winds of change blew, but like the winter itself were mild - leaving Canada's political landscape under a dusting of snow, but not unrecognizable. Nationally, the Conservatives won a slim minority government with 124 seats. This includes a breakthrough in the east and Quebec. Rural Ontario swung Conservative due in large part to the Conservative stance on the gun registry and bill C-38 - issues which this minority parliament will be unlikely to reverse, and most Canadians want left alone. American media was quick to display pleasure with Harper's win. The New York Times exuded hope for conservative Republicans everywhere, stating Harper was a "free-market economist who expressed strong support for Washington at the time of the American-led invasion of Iraq." Fox news heralded the end of a 13-year Liberal Presidency. Whitehouse officials cheered Harper's Conserative win and expect Harper will shift Canadian foreign policy more in-line with George W. Bush's. Liberals managed to retain 103 seats, with most cabinet ministers being returned. Notable exceptions were Treasury Board president Reg Alcock, Foreign Affairs Minister Pierre Pettigrew, Liberal House leader Tony Valeri, Heritage Minister Liza Frulla and Deputy Prime Minister Anne McLellan. Paul Martin kept his own seat, but announced his intention to step aside as Liberal leader, paving the way to the expected leadership race. The NDP checked in with 29 seats, raising their presence by 11. With the Liberals being leaderless, this group has the task of keeping Harper's Conservatives from swinging Canada too far to the right. In Quebec, the Bloc Quebecois saw their caucus actually shrink by 3 seats despite earlier predictions of a sweep. With only 42.1% of the popular vote, Duceppe was denied his magic number of 50%, putting sovereinty referendums out of reach for the foreseeable future. On the local scene, Conservative Dave Van Kesteren will take a leave from his imported car dealership and head to Ottawa with 20818 votes. Liberal Jim Comisky came second with 15131. 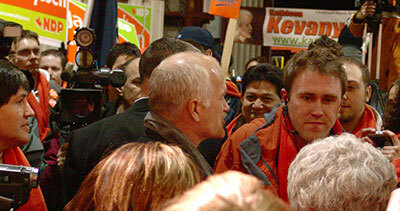 The NDP ran a strong issue-oriented campaign which garnered 10865 votes for Kathleen Kevany. Ken Bell boosted the Green Party vote to 1737. The riding of Chatham-Kent-Essex voted overwhelmingly center/left, which elects Conservatives under the Canadian system. Mr. Van Kesteren would be wise to remember that his Conservative-right party was elected largely as a Liberal protest and does not have a mandate to shift Canada to the right, nor do those views represent the wishes of local electors. Voter turnout in Chatham-Kent-Essex increased to 65.3%. In Lambton-Kent-Middlesex, Conservative Bev Shipley won the seat with 25170 votes. Former Wallaceburg mayor Jeff Wesley brought the Liberals to 2nd place with 16935. Kevin Blake got 9286 votes for the NDP, and Green Party candidate Jim Johnston was chosen on 2156 ballots. Voter turnout was higher than the national average with 69.4% of eligible voters reporting to the polls. The highlight of the event was a rousing speech from Mr. Layton, which he gave while surrounded on stage by Dr. Kevany and other Southwestern Ontario NDP candidates including Irene Mathyssen, Tim McCallum and Stephen Maynard. The speech focused on helping to elect as many NDP candidates as possible to the House of Commons and refusing to give in to the notion that the Liberals and Conservatives were voters' only option on Election Day. Referring to these other political parties, Layton assured the gathered crowd of supporters that their work was for a worthy cause, that there was indeed an alternative to "corruption or Conservatives." Layton asked that his supporters, "take all the work that you've already done, and double, and triple that effort, and put that into the last two days of the campaign," a plea that elicited massive cheers in the affirmative. Those assembled, along with Mr. Layton, seemed very enthusiastic and relaxed, despite the late hour and the fact that the event was held over 7 1/2 weeks into an eight week election campaign. 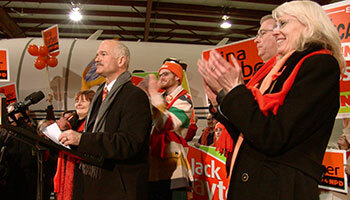 Reflecting on the event, Chatham-Kent Essex NDP Candidate Kathleen Kevany stated that, "it was great to see Jack so poised and collected up on stage. He really believes that all of our candidates, including myself, have the chance for great success during this election. His inspiration solidifies my belief that we can elect our first New Democrat as MP in Chatham-Kent Essex, as well as in many other area ridings." Mr. Layton continued onward to Hamilton, and then Toronto, where he will finish out his campaign. Dr. Kevany will conclude her campaigning with stops in local communities across Chatham-Kent Essex on Sunday, and hold a celebratory event at Spiro's Restaurant in Chatham, starting at 9:30 on Election Night. It would be very difficult to have lived in the Chatham-Kent Essex area in recent years and not be aware of the growing employment crisis in the manufacturing sector, and, more specifically, the Auto Industry. More than 150 000 Canadians work in the Auto Industry and every job in a major auto facility creates 7.5 jobs in the national economy. Yet it is no secret that free trade and years of neglect by various levels of government have resulted in the industry reaching the ominous crossroads that it has today. In the opinion of the Chatham-Kent Essex NDP, and its candidate Kathleen Kevany, the current election campaign has not focused sufficiently on this very pressing concern. 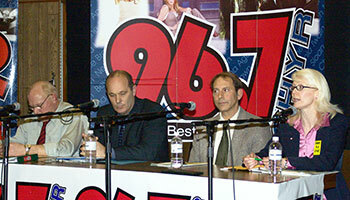 In fact, statements revealing Conservative policy such as that made by candidate Dave Van Kesteren during the all candidates debate last Thursday night, held at Branch 28 Legion, and broadcast by CFCO, in which he expressed no intention of protecting jobs in the auto sector, have largely gone unnoticed. As a result, the NDP have invited representatives of various unions and members of a variety of sectors in the community to discuss this very important circumstance as the countdown to the election on January 23rd continues. The event will be held at the National Office of the CAW, 200 Riverview Drive, Chatham, at 4 PM, on Tuesday, January 17th. It is hoped that a strong representation of area media will be in attendance to focus on this significant issue and to discuss it with the community members present. In commenting on the position of the Conservative Party as presented by the local candidate, Dr Kevany stated, "Members of this community should be concerned about Mr. Van Kesteren"s statement that protecting Canadian content and jobs is 'unworkable.' This important issue demands proactive leadership. The NDP has progressive policy to share and invites input from local leaders." NDP candidate Kathleen Kevany hit her stride in the CHYR debate held at the Leamington Legion on Wednesday evening. Fielding a variety of questions from taxation and electoral reform to border congestion and Iraq, Kevany demonstrated why her campaign is picking up steam as Election Day approaches. On the Conservatives' plan to reduce the GST, Kevany pointed out that it was these same Conservatives who instituted the tax in the first place and that it was the Liberals who promised to scrap it only to renege on their promise. "And, at any rate," she stated, "it would be a tax cut that would benefit the well off more clearly than those less fortunate who often find it difficult to make ends meet." She went on to say that the NDP would target GST reform by removing it from essentials such as heat and hydro. When the problem of rising taxes in municipalities arose, Kevany drew the clear relation between Federal cutbacks, impacting on Provincial Governments that in turn cut transfers to the municipalities. "It is wrong to blame municipalities totally for the tax hikes, as they are forced to reflect the cuts that begin at the Federal level," she said. Commenting on violent crime, Kevany stated, "We in the NDP wish to remove the hands from the guns," as she outlined a two tiered solution of strict punishments coupled with policies that address problems that underlie violent crime such as poverty and drug abuse. 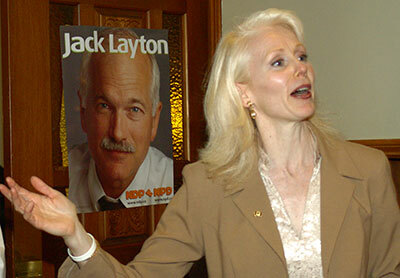 When dealing with an issue of great interest in the Leamington area, border congestion, Kevany pointed out that neighbouring NDP MPs, Joe Comartin and Brian Masse achieved more in opposition than even Liberal MP Herb Gray while holding the position of Deputy Prime Minister and that she would continue to press in the NDP caucus for viable solutions to the problem. Other participants in the debate were Ken Bell of the Green Party, Dave Van Kesteren, Conservative and Jim Comiskey, Liberal. Ken Bell deftly put forth the environmentally focused Green commitments often taking pains to showcase the more economically oriented Green Party policies. Dave Van Kesteren was polished throughout the event in fielding media and public questions, but his general response to an agriculturally oriented question along with his defence of his leader, Stephen Harper's position on Iraq, elicited displeasure from those in attendance. Jim Comiskey, for the second night in succession, drew boos and catcalls from the audience. On Tuesday, in Tilbury, it was his comment that the high price of the gun registry was caused by the resistance to it that resulted in audience displeasure. On Wednesday evening, it was his denial that child poverty exists in Canada followed by what were termed to be comments insensitive to the poor, that raised the hackles of observers. 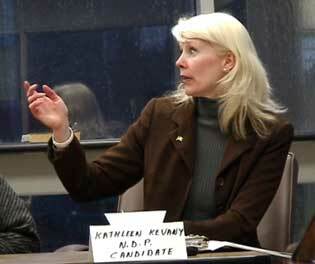 Following the debate, Kathleen Kevany reflected on the number of all candidates" meetings that have been scheduled during this campaign by stating, "I always appreciate an opportunity to exchange views with my colleagues running for office and interested voters, and all candidates forums provide the best opportunities to do this. I am thankful that there are sufficient interested citizens in the community that take the initiative to organize these events," she concluded.